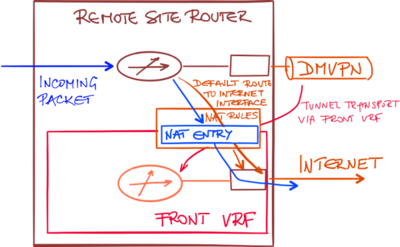 DMVPN designs with front-door VRF (VRF use to transport DMVPN data across WAN network) are extremely common with Phase 2 and Phase 3 DMVPN or Cisco IWAN deployments. 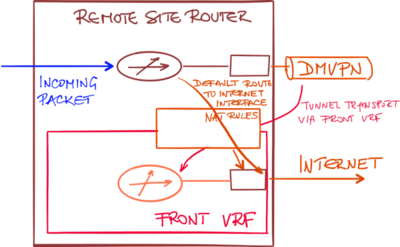 In these designs, a transport (front) VRF is created, and the WAN interfaces are placed in the transport VRF. This VRF has an independent routing table and default route, allowing the DMVPN traffic to use a different default route than the user-generated traffic. For more information on DMVPN technology and DMVPN designs, watch the webinars from the DMVPN Trilogy. If you want to combine the front VRF designs with local Internet exit (and associated Network Address Translation – NAT), you have to implement inter-VRF NAT. 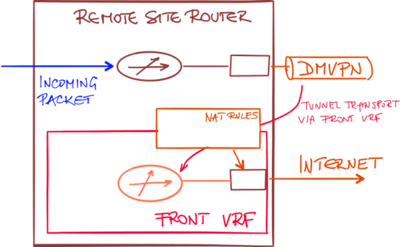 Packets received through the global routing table (user traffic) have to be translated using NAT rules associated with an interface belonging to the transport VRF. Configuring the NAT rules between the global routing table and transport VRF is not enough. There must be an entry in the global routing table (for example, a default route) that will send the incoming packet toward the Internet-facing interface. The best default route should point to the local Internet uplink for the local Internet exit to work. The simplest design that achieves this requirement is a default-free internal network. With a route pointing to the Internet interface, the incoming packet might get forwarded to the upstream DMVPN tunnel (if the hub router announces a default route) or dropped. Once the default static route pointing to the Internet interface is present in the global routing table, the incoming packet could be sent toward the Internet interface creating a NAT translation entry on the way. 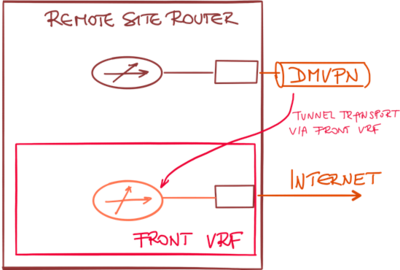 There’s no need to have a static route in the transport VRF to handle the return traffic. The NAT translation entry created by the outgoing packet contains ingress and egress forwarding table information. When the return packet arrives, its (outside) destination IP address is in the transport VRF and thus routable to local interface which contains the NAT rules and associated NAT translation table. When the destination IP address in the return packet is translated using the NAT translation entry that was created by the outgoing packet, the return packet is automatically forwarded using the correct forwarding table. Static NAT entries are an obvious exception. Routes toward these destinations would have to be leaked from the global routing table to the transport VRF. While Cisco IOS doesn’t have a global-to-VRF route leaking functionality, PBR seems to be a good alternative. 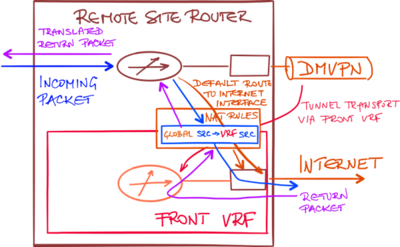 For more information on VRFs and inter-VRF NAT in Cisco IOS, watch the Enterprise MPLS/VPN webinar.